While reading one of the many pages claiming to have "15 Amazing Life Hacks" or something similar, I found a claim about quickly cooling a drink that deserved some investigation. The post claimed that to quickly cool your favorite drink you should wrap the bottle/can in a wet paper towel and put it in the freezer. Supposedly this would quickly cool the drink, faster than just the freezer. My guess is that the thought process says evaporative cooling is the culprit. This is why we sweat, evaporating water does indeed cool the surface. Would water evaporate into the cold, but dry freezer air? Below we'll look at a couple of experiments and decide if this idea works! We will attack this problem with two approaches. First I'll use two identical pint glasses filled with water and some temperature sensors, then we'll actually put glass bottles in and measure just the end result. While the myth concerns bottles, I want to be able to monitor the temperature during the cooling cycle without opening the bottles. For that we'll use the pint glasses. First I had to build the temperature sensors. The sensors are thermistors from DigiKey since they are cheap and relatively accurate as well. To make them fluid safe, I attached some three-lead wire and encapsulated the connections with hot-glue. The entire assembly was then sealed up with heat-shrink tubing. 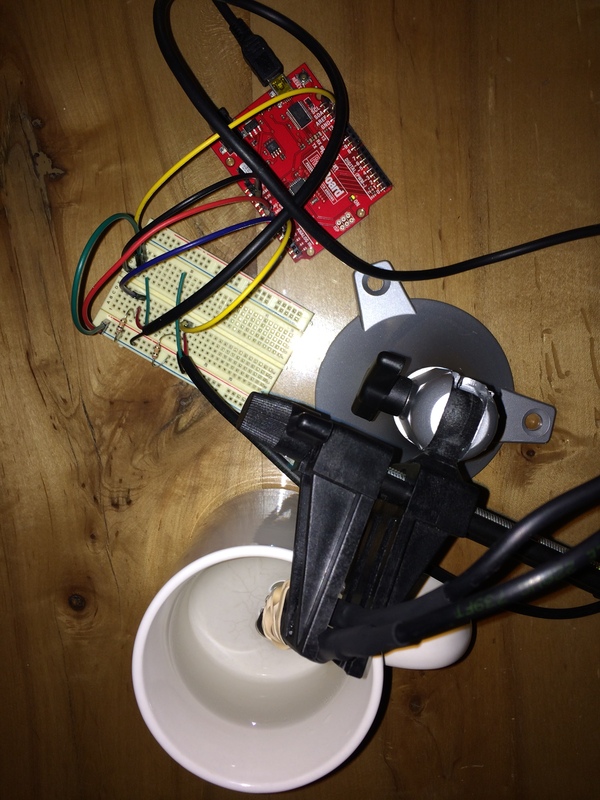 I modified code from an Adafruit tutorial on thermistors and calibrated the setup. To make sure that both sensors had a similar response time, we need to do a simple control test. I placed both probes in a mug of hot water right beside each other. We would expect to see the same cooling at points so close together, so any offset between the two should be constant. We also expect the cooling to follow a logarithmic pattern. 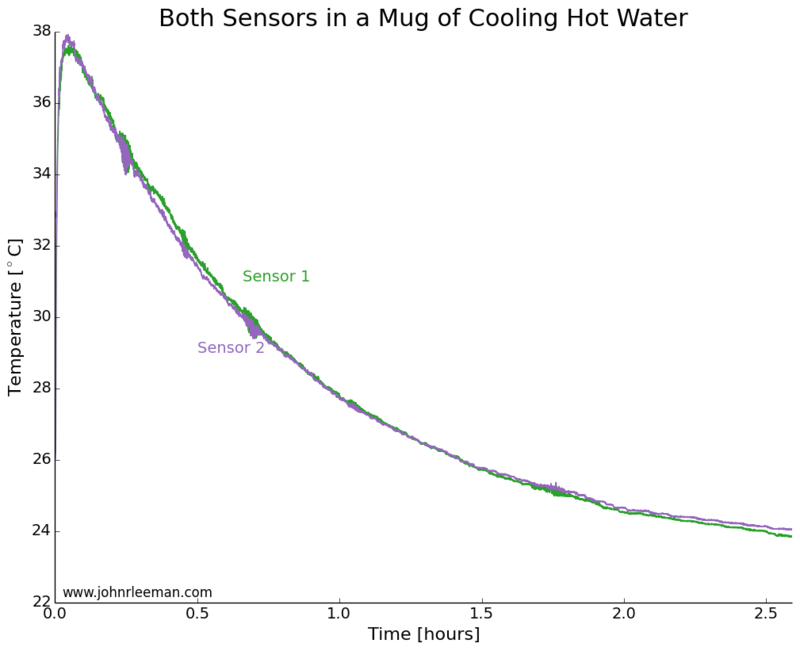 This is because the rate of heat transfer is proportion to the temperature difference between the water and the environment (totally ignoring the mug and any radiative/convective transfer). So when the water is much hotter than the air, it will cool quickly, but when it's only slightly hotter than the air it will take much longer to cool the same amount. Plotting the data, we see exactly the expected result. 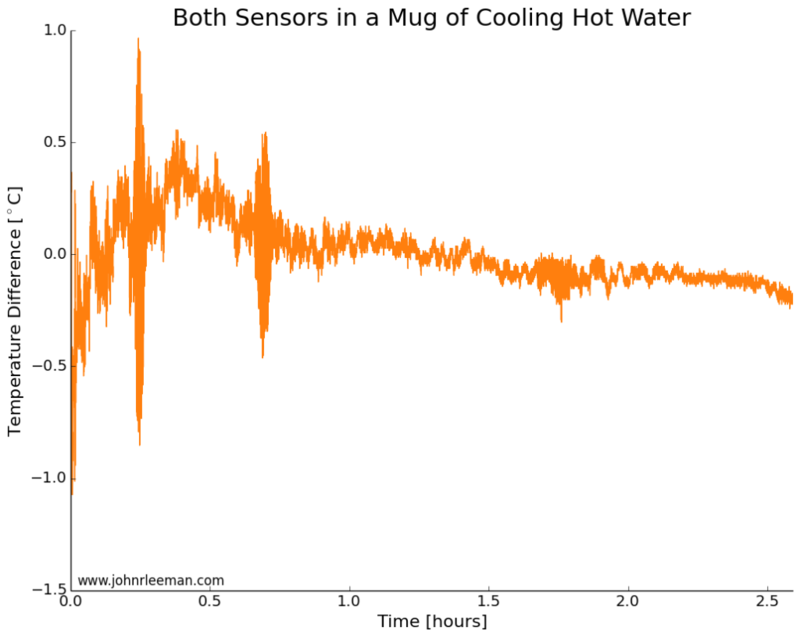 Both sensors quickly rise to the water temperature, then the water cools over a couple of hours. The noisy segments of data about 0.25 hrs, 0.75 hrs, and 1.75 hrs in are likely interference from the building air conditioning system. If we plot the temperature difference between the sensors it should be constant since they are sensing the same thing. These probes look to be about dead on after calibration. Other than the noisy segment of data, they are always within 0.5 degrees of each other. Now we can move on to the freezer test. I used two identical pint glasses and made thermocouple supports with cardboard. 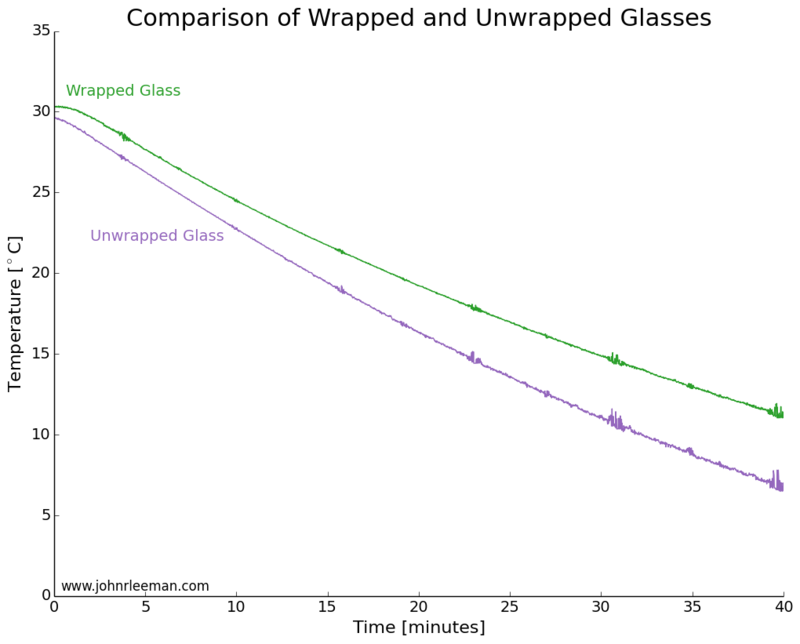 One glass was wrapped in tap water damped paper towel, the other left as a control. Both were inserted into the freezer at the same time and the temperature monitored. The water was initially the same temperature, but the readings quickly diverged. The noisy data segments reappear at fixed intervals suggesting that the freezer was turning on and off. 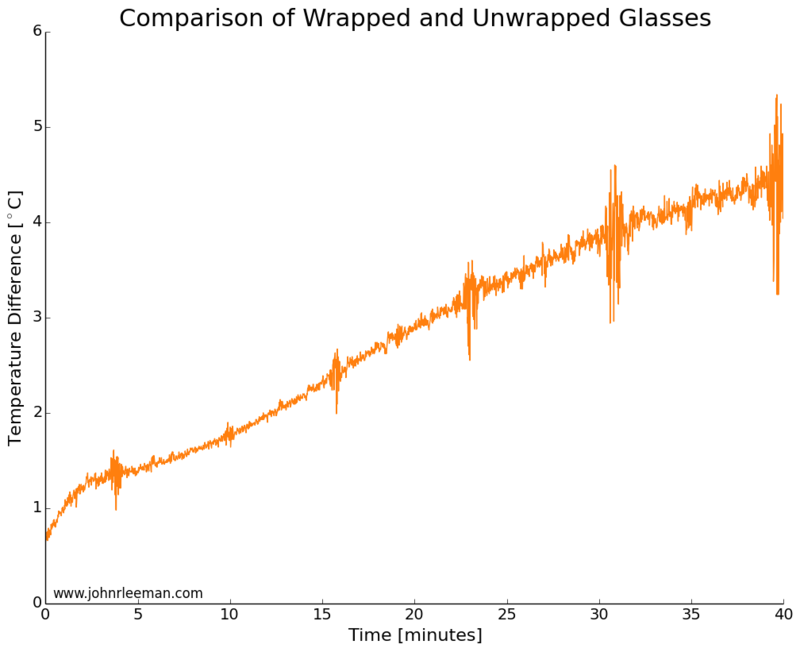 The temperature difference between the sensors grew very quickly, meaning that the wrapped glass was cooling more slowly than the unwrapped glass. This is the opposite of the myth! 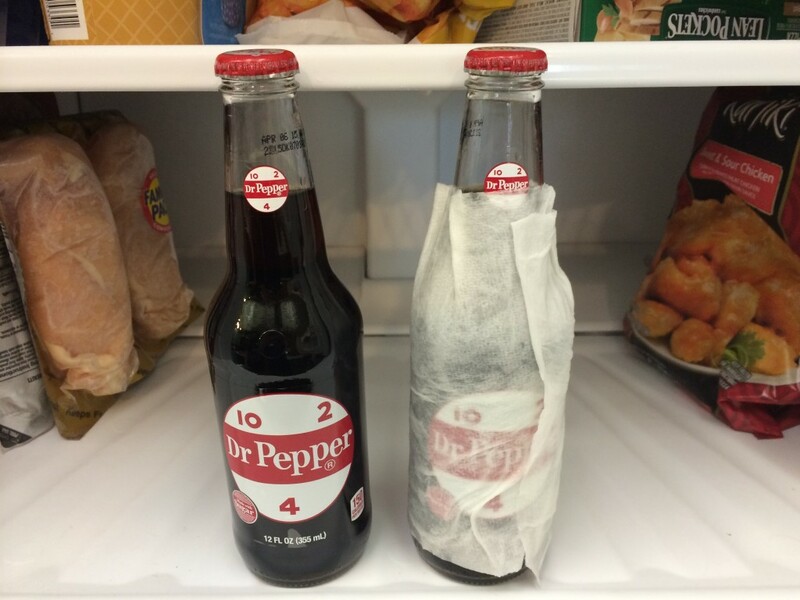 Next I placed two identical, room temperature bottles of soda in the freezer, again with one wrapped and one as a control. After 30 minutes in the freezer, the results showed that the bottles and their contents were practically identical in temperature. The wrapped bottle was slightly warmer, but it was within the resolution of the instruments (thermocouple and IR sensor). I did this test multiple times and always got temperatures within 1 degree of each other, but not consistently favoring one bottle. So what's happening here? Well, I think that the damp paper towel is actually acting as a jacket for the beverage. Much like covering yourself when it's cold outside, the damp paper towel must be cooled, then the beverage can cool. Adding that extra thermal mass and extra layer for the heat to diffuse through. To provide another test of that hypothesis I again tested bottles with a control and a foam drink cooler around the base. The foam cooler did indeed slow the cooling, the bottle being several degrees warmer than the control. The last question is why did the test with the glasses show such a pronounced difference, but the bottle test show no difference? My best guess is that the pint glass was totally wrapped vertically and that bottle had the neck exposed still. Another difference could be the thickness of the towel layer and the water content of the towels. The Conclusion: BUSTED! Depending on how you wrap the paper towel it will either have no effect or slow down the cooling of your favorite drink. Let me know any other myths I should test! You can also keep up to date with projects and future posts by following me on twitter (@geo_leeman). This entry was posted in Education Opportunity, Electronics, General Science, Open Source and tagged heat transfer, Myth, Mythbusting, Science. Bookmark the permalink. I believe the real method is with a dry paper towel, but people generally presume that is an error and that it must be a wet one. That is not to say I believe it works, but that I wish you tested that method too, because I think it would be interesting to compare this third method to the other two, and your sensor system appears sensible! I hadn't heard of the dry paper towel, but it would also act as an insulator. Not as effective as the wet towel possibly, but it indeed would not change the results. Thank you for reading! This is important research. I've debated the effectiveness of this method with my wife for a while now. My theory for why people still think this works: pulling a wet object out of the freezer feels a lot colder than a dry object. Thanks! Evaporative cooling is indeed something that fools people pretty often, but in this case it's not a thin film of evaporating fluid, but a thick wet blanket. The getting out of the shower and feeling very cold experience does make an imprint on everyone though! I have been thinking about a hot vs. cold water freezing experiment for awhile, but as the article points out, getting the controlled conditions is difficult. I do need to redo this experiment though as others claim to see the opposite, which I'd like to check and re-check. Maybe I'll add a hot paper towel for fun! I'd like to find a more controlled freezer to use as well - maybe I need to make some friends over in the biology group! Please do the experiment again but this time with an aluminum can. I believe you'll have different results. Shouldn't change the thermodynamics of the system. There are a lot requests to look at this again, so there may be a revisit. what about aluminium fins on aluminium wrapping to increase surface area of the vessel and act as a heat sink? That could be pretty effective I'd think. The principal behind this technique is freezing temperatures. This "life tip" is usually aimed at alcoholic beverages which have a lower freezing temperature than plain water. So the water crystallizing on the outside of the alcoholic beverage, through conduction (touching the glass), would create a significant heat gradient which should cool the beverage quicker than convection (cold air flowing around the freezer). Of course you wouldn't see too great of a "cooling" effect on sugary non-alcoholic beverages since those have a freezing point very close to actual water. I'm going to be retesting this myth due to popular demand, but the fluid being chilled should have little to no effect. The cooling rate could be different, but the different in wrapped and unwrapped should stay the same. The fact that you crystalize water in the paper towel actually fights cooling the beverage. Freezing water releases energy and would actually slow the cooling process. Either way, stay tuned for the revisit! What if evaporative cooling is the trick to this, and using a freezer/ refrigerator is wrong. So, the test would be, wet (not damp) paper towel, with a cool fan blowing across it. This way the paper towel doesn't freeze, and the fan should provide the evaporation. Just a thought. Thanks for the idea! I've actually just finished another round of testing and am working up the post now. Expect a lot more data very soon! It's interesting you received this result, as other tests have clearly shown a benefit with the wet towel. I wonder how much of an effect the environment (specifically humidity) effect this. Do you happen to live in FL or a humid area of the country? Another thought, in an experiment where I've seen this work, the bottles were laid horizontally on the floor of the freezer. The higher thermal conductivity of water to air and greater surface area of a wet towel may help transfer heat out of the bottle quicker in this case. I'm in PA currently. I've got tests that possibly contradict this initial result rolling out now. Check back in about a week! I think the end result will be it doesn't make enough difference to bother with, but the data will tell. Unfortunately I don't even have to test this one. Thermodynamics proves it to be impossible. Compressing air warms it. The reason this lowers the temperature is that a piece of thermally conductive tin or cheesecloth is replaced by a piece of insulative foam board that also shades the interior. I think the problem is the phase change. When doing calculation for amount of heat to melt ice to water and the amount of "coldness" to freeze water to ice, the biggest factor is not the change in temperature needed, it's the energy absorbed or released during phase change. I put "coldness" in quotes because it'd really not a thing. "Coldness" is the absence or removal of heat. Assuming two bottles that are being cooled at the exact same rate. All of the "coolness" acts directly upon the bottle without the paper towel wrapped around it. Where as the coolness is acting upon the bottle and the paper towel and the water in the paper towel in the wrapped up bottle. As the water in the paper towel begins to freeze, the phase change actually results in the water molecules releasing energy and an increase in energy (or temperature in this case) immediately surrounding the bottle causing the slower decrease in temperature. To the point about evaporative cooling, this is a phase change in the opposite direction. When we sweat and air blows across our bodies, the water evaporates (or a phase change from liquid to gas). This phase change results in the water molecules absorbing energy as it changes state, and part of this energy is hear from the surface upon which the liquid water molecules is resting, our skin. When heat is absorbed from our skin, it feels like a cooling effect. So if you put two bottles, one wrapped in a wet paper towel, out in a cool breeze, in that case the wet paper toweled bottle will get slightly more cool over time. although I don't doubt the results and work behind your experiment. I for one can say that I do this all the time and IT WORKS. usually with bottles, wrapped in wet paper towels. It gets cold so much faster than when its not wrapped. sometimes ill put the beverage make a quick bite and when i take it out the papertowel is frozen and even the beverage starts to freeze. Im baffled at the results of the experiment, I've see it actually work plenty of times. This method does work. Think about this. You are out in freezing temperatures. You have an insulated jacket on. This keeps you warm until you fall in the creek. Correct me if I'm wrong but I'm pretty sure this causes hypothermia to kick in quicker. So in my mind if a wet jacket chills the body quicker then wouldn't a wet paper towel chill my beer quicker also? Just food for thought. Aaron - Confounding factors are at play here. The jacket keeps you warm by holding air still near your body. Air is an excellent insulator and it is what keeps you warm. Falling into the creek fills the pockets of the garment with water, there is much less air space and the thermally conductive water helps very efficiently radiate your body heat to the atmosphere. Aaron is on to something I beleive. I will assure you, this works. The wet paper towel definitely makes a difference. I will leave it in the freezer for a bit and the paper towel will come out frozen solid, stuck to the can or bottle. I am a senior in high school right now and I want to do this project for my physics class. IB requires seniors to publish substantial papers in each subject, and I want to do this for physics. John, if you have done these experiments could I get in contact with you to pick your brain? Hi. We've been doing a similar research with a friend and our conclusions are the same as in your article, namely a dry bottle is the fastest one to cool. We checked out a thick-ish wet cloth and a thin wet hygienic tissue, cloth slowed the cooling down considerably and the tissue a little bit. Looks like evaporative cooling doesn't really come into play in a non-ventilated freezer. On the other hand we've also tested cooling the drinks outside (it's currently ~0C here) and even the wet cloth is better than the bottle alone, with wind speed being a major factor in how quickly the beverage actually cools. Have you tried with carbonated beverages? My tests seem to indicate there may be a difference, but I'm still trying to figure out why. Just 40% alcohol. It'd be weird for carbonation to have any effect on this honestly. I was surprised, but it seems to be robust over 3 experiments. I realize this is quite old in internet years. But I've used this technique for many human years to great success. I've also done some admittedly less involved home testing. Using two cans of beer that sat on the same counter for 24 hours to attain identical temps. Placing them in the same freezer for 15min. Removing, opening, and pouring the beer and gaining temperature readings with a simple liquid thermometer in two pint glasses that sat on the same counter for 24 hours. The wet paper towel was, on average, 10 degrees (F) cooler every time. EXCEPT, when the freezer fan was off, or if the can was not in the path of the airflow! In a still air freezer, the temps after 10 identical tests were less than 5 degrees (F) different. Also, temperature of the water for the paper towel was a factor as well. Coldest or Warmest tap water made virtually no difference. But water that was about room temp resulted in the biggest drop in the freezer. Also worthy of note, aluminum cans provide a quicker drop in temp than glass bottles. Thick plastic (like on a gatorade bottle) over 30 minutes will drop considerably, but 15 min was not much of a drop. Wrap a can or bottle in a paper towel with luke warm water, place in freezer near blower fan. (you may have to turn your freezer setting to colder to get i to stay on for 15min). wait 15-20 min. done! just last night a wrapped bottle of brooklyn summer ale, put in the freezer at the same time as an unwrapped bottle (both bottles room temp), froze in 30 min...while the unwrapped bottle still was not "cold" to the taste. Thanks for the comment - I think we're going to get some custom bottles with thermocouples embedded in the caps to really test it again. I also have a thermal chamber now to have better controlled conditions. Just on a lark yesterday, I did an impromptu test of this with 2 tall, thin La Croix aluminum canned drinks that had been in my car. I was going to cool them down to drink for dinner so thought I might as well test this out too. Starting from the temperature from when I brought them in from the car, I wrapped a wet towel around one and put both in the fridge. After 45 min, I used a digital instant-read thermometer to sample both. The towel-wrapped can was 10F cooler than the non-wrapped. After another 20 min, the difference was even more (can't remember) exactly. By then dinner was ready so I served them both. So just from that informal test, I'm pretty certain, at least for metal cans, the wet towels definitely helped the drinks cool faster. So my results roughly confirmed Kel's findings. I'll perform another test, this time with glass bottles, next time I have to cool down some beers for dinner.